If you're a natural food enthusiast or like fresh, healthy green juice, you may have difficulty finding fresh wheatgrass juice at your local market. If you do, it can be prohibitively expensive. One way to solve the problem is to plant your own wheatgrass, which is surprisingly easy. In about a week, you'll have a healthy batch of wheatgrass for use. As an added benefit, wheatgrass is green, lush and attractive, so you'll have something to look at while you're waiting. Soak about a pound of wheat seeds in a large bowl filled with warm water. Cover the seeds with water approximately triple the depth of the seeds, which will absorb much of it. Allow the seeds to soak for eight hours. Fill a planting tray to a depth of 1 1/2 to 2 inches, using a mixture of half commercial potting soil and half compost. Moisten the mixture with a spray bottle. Drain the wheatgrass seeds in a colander. Rinse them in clean water and drain them one more time. 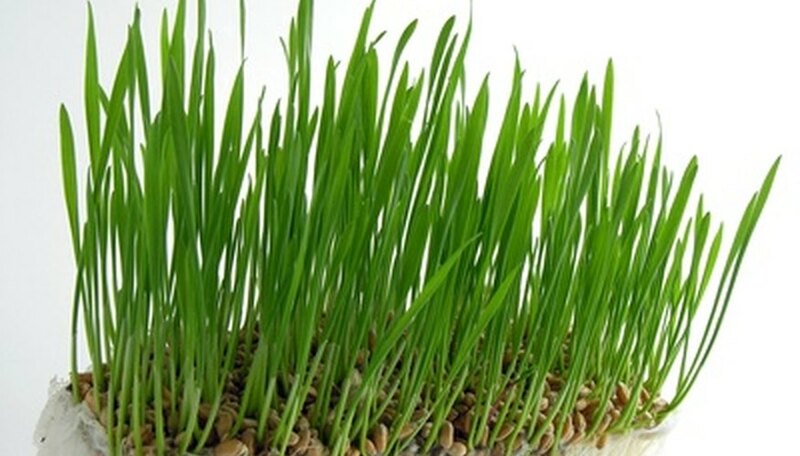 Spread the wheatgrass seeds in a single, even layer over the soil mixture. Add another 1/2 inch of the compost and potting soil mixture over the seeds. Lightly water the seeds with a spray bottle or with a watering can, being careful not to loosen the seeds. Place the tray in bright, indirect sunlight. Water the seeds lightly every day. The wheatgrass will be ready to harvest in about seven to 10 days, depending on the temperature. Harvest the wheat grass by using sharp, clean scissors to cut the grass about 1/2 inch above the soil.